Emeli Sande - An Olympic Experience | Life, Sport and Diabetes - An everyday look at my life with type 1 diabetes. Last May I carried the London 2012 Olympic Flame onto the main stage in front of 20,000 people in Cardiff. In front of the crowd I lit the cauldron, before getting the opportunity to briefly speak about sport and diabetes. This was all thanks to a nomination from the fantastic charity Diabetes UK. During the day long event many bands and singers performed, ranging from You Me At Six and Kids in Glass Houses. 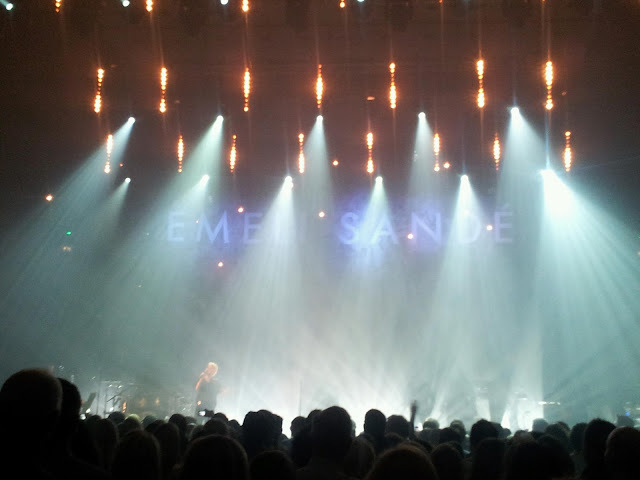 Before I went onto the stage with the flame, Emeli Sande also performed a number of songs including 'read all about it'. Unfortunately I missed her performance because of being on the torch bearer bus, that was travelling around Cardiff dropping off the other torch bearers and giving them their moment to shine. After realising I'd missed her performance I was really disappointed, as she soon became the face of the Olympic Games and her songs synonymous with the Olympic Experience. So last night I was absolutely thrilled to be able to finally see and hear her perform in a fairly intimate sized gig at Colston Hall in Bristol. Singing live she was every bit as good as I'd hoped she would be. She sang all of the hits that were enjoyed by so many people, at the opening and closing ceremonies of the London 2012 Games. And hearing 'Read All About It', brought back such fantastic memories of carrying the torch that day. Mentioning how it had been 'one of the many highlights of her career so far', Emeli also seemed to share very fond memories of the Olympic Experience. Look out for May's blog's about 'Carrying the Olympic Flame- A Year On'.